Historically, an ensuite was a fully separate space to the bedroom it served, commonly accessed via a walk-through wardrobe. 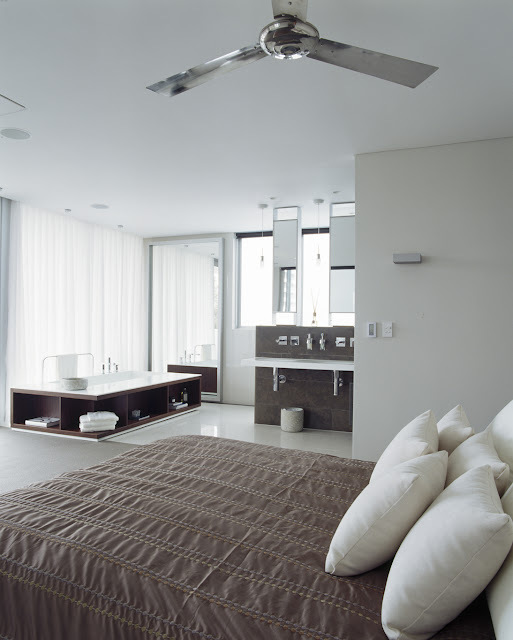 Recently however, ensuites are increasingly being incorporated into the bedroom and the two spaces reinterpreted as one - The Parents Retreat. This development is a natural evolution of the open-plan idea readily embraced in other areas of the home, says Minosa designer Darren Genner. "More and more people building new homes are asking for this kind of design (Parents Treats) and with bathroom furniture now becoming very design focused why not have an open space? Like the evolution of the living space into open-plan areas with kitchens, it allows more than one person to use the space." "When the client approached Minosa to design this space they wanted something that was semi-open to the bedroom. As this is the parents' retreat they wanted a hideaway, somewhere they could go to get away from the kids, somewhere to relax and unwind. 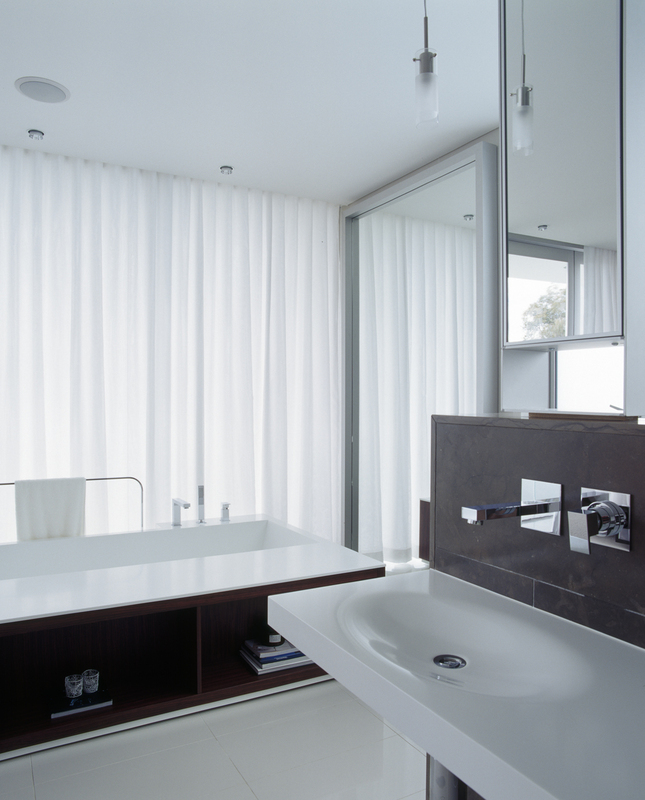 We wanted to create a space that was very open, but still had some privacy," says Genner. Originally, the architect's plans called for more separation between the two areas. 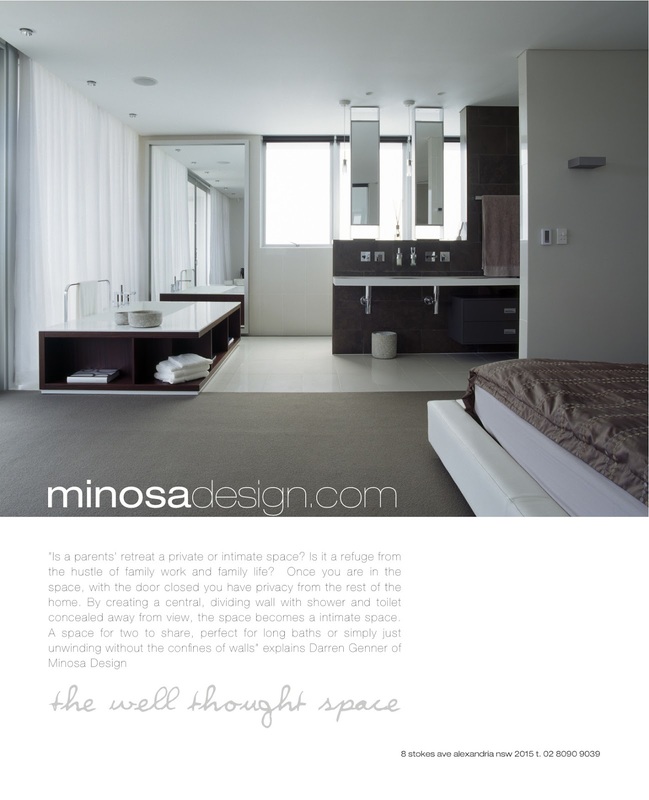 The Minosa design places an emphasis upon establishing a dramatic space, with importance given to the physical elements within it – such as the bathtub – and through them creating areas of interest. 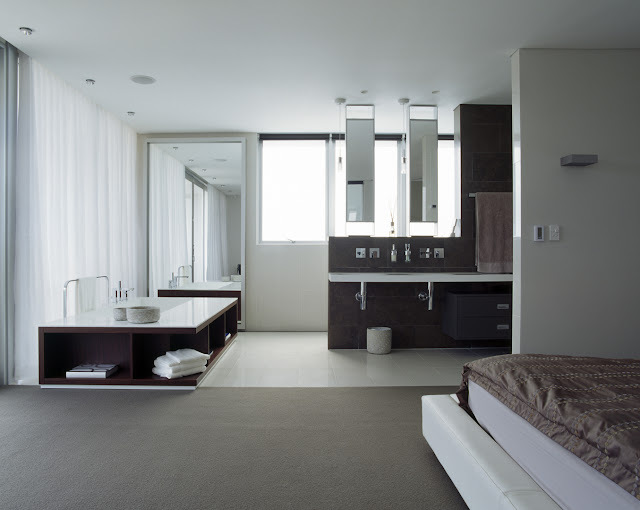 "The bath was selected during the process of design, after we had pitched the single space concept to the client. It was clear that we needed a squarish bath to create maximum impact within the space, and also to suit the style of the home," says Genner. Once chosen, the bathtub's placement became pivotal. 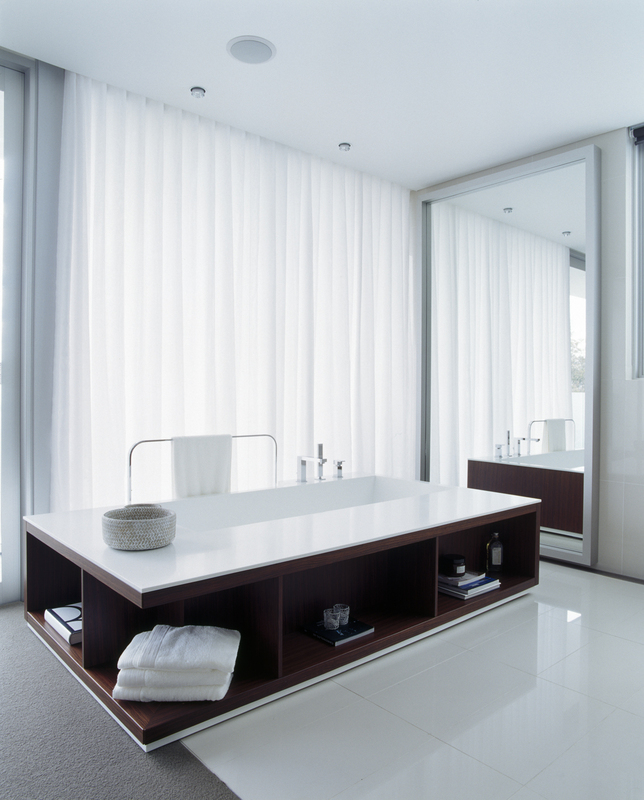 As a focal piece, it was vital the bath didn't become an object of demarcation, says Genner. "We were not trying to define the space, but wanted to convey a unified feel. 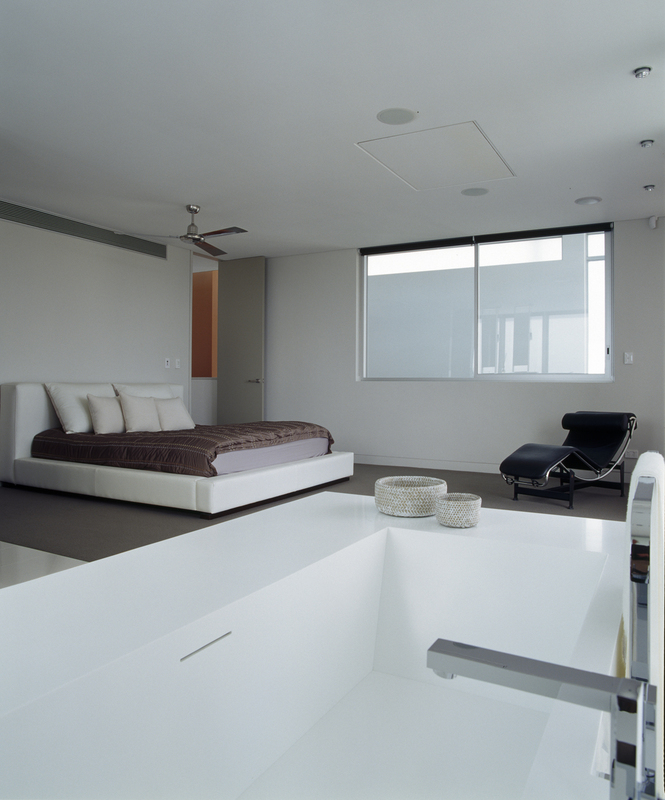 By having the library section of the bath on the carpet, the tub becomes a real furniture element." As an emerging practice, open plan suites are reflective of our changing notions around privacy, says Genner. "Is a parents' retreat a private or intimate space? Once you are in the space with the door closed you have privacy from the rest of the house. Blinds and curtains on every exterior window provide privacy from the outside, and the centre wall was adds internal privacy to the toilet and shower areas. All of these things work together to create an intimate space."